Mutiny on the Bounty (1935) is one of the best nautical adventure films of all time and one of MGM's greatest classics. 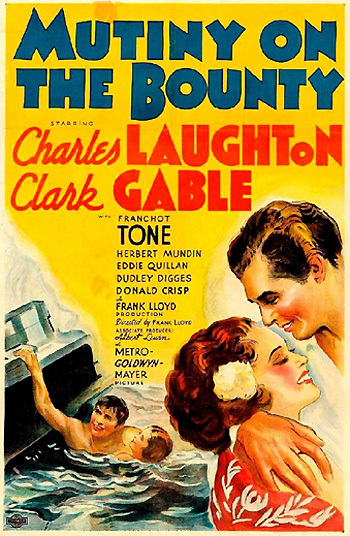 The rousing, 18th century story of the Bounty's mutiny, directed by Frank Lloyd, was adapted from the first two volumes of the Charles Nordhoff-James Norman Hall 1932 best selling novel The Bounty Trilogy (composed of Mutiny on the Bounty, Men Against the Sea, and Pitcairn Island). It echoed the semi-documentary In the Wake of the Bounty (1933, Australia) which starred Errol Flynn in his movie debut as Fletcher Christian; both films were based upon the 1932 novel Mutiny on the Bounty by Nordoff and Hall. For authenticity, the film was shot on location in the South Pacific's Tahiti, as well as on Catalina Island, Santa Barbara, and in MGM's Culver City studios, over a period of three months. The over-budget (about $2 million) MGM film was the studio's most expensive production since Ben-Hur: A Tale of the Christ (1925), but it was also the highest-grossing film of 1935 (at $4.5 million). It was nominated for a total of eight Academy Awards, and its sole Oscar was for Best Picture. It was very unusual that the profitable film received no other Oscars than Best Picture (two other earlier MGM productions had done the same thing - The Broadway Melody (1928-29) and Grand Hotel (1932)). The other seven nominations included three Best Actor nominations (Clark Gable, Charles Laughton, and Franchot Tone, who split the vote and gave the award to Victor McLaglen for The Informer) - a unique accomplishment (although Tone's performance was more like a supporting role, but the awards category hadn't been created yet), Best Director (Frank Lloyd), Best Screenplay (Talbot Jennings, Jules Furthman and Carey Wilson), Best Film Editing (Margaret Booth), and Best Score. It was the first film to have three acting nominations, and the first film to have three co-performers competing against each other in the same category - as Best Actor. "A thousand hours of Hell for one moment of love." [Note: The first choice for the Bligh role was Wallace Beery.] Virile Clark Gable, who had won the Best Actor Oscar the previous year for It Happened One Night (1934), took the secondary role as the fair-minded First Mate Fletcher Christian, although he was reluctant to wear silly-looking breeches, sport a sailor's pony-tail, and shave off his mustache. With his performance, he solidified his status as one of the leading actors of the 30s. The screenplay departed from some of the facts of the true event by romanticizing the cavortings of the 'beefcake' crew with the Tahitian native women, and by distorting the historical record with a denouncement and snubbing of the contemptuous, malevolent Bligh at the conclusion of the court-martial trial - in fact, the notorious Captain Bligh was later promoted to the rank of Vice Admiral by the British Navy. [Note: Of the various film versions of the tale, The Bounty (1985), starring Anthony Hopkins as Bligh and Mel Gibson as Fletcher Christian, was the most accurate.] One remake, starring Marlon Brando and Trevor Howard, the 70 mm Panavision widescreen version of Mutiny on the Bounty (1962), fared poorly. To the voyage of the Bounty. Still waters of the great golden sea. Flying fish like streaks of silver, and mermaids that sing in the night. The Southern Cross and all the stars on the other side of the world. They respect but one law - the law of fear...I expect you to carry out whatever orders I give, whenever I give them. The ship's company will remember that I am your captain, your judge, and your jury. You do your duty and we may get along. Whatever happens, you'll do your duty. He barks chilling, staccato orders to his Master's Mate in an oft-repeated line: "Mr. Christian - come here." He cruelly and sadistically meets a sailor's request for water in the hot weather: "I'll give you water. Mr. Morrison. Keel haul this man." I've never known a better seaman, but as a man, he's a snake. He doesn't punish for discipline. He likes to see men crawl. Sometimes, I'd like to push his poison down his own throat. The voyage is long and arduous, but the Bounty finally arrives in Tahiti. Christian is ordered to stay on deck, but Byam is allowed to go ashore, where he is befriended by Hitihiti, the island's chieftain. Byam is quickly entranced after meeting and falling in love with one of the beautiful Tahitian women, Tehani (Maria "Movita" Castaneda, who later married Marlon Brando!). When the chief arranges for Christian to come ashore for one day, the Master's mate also meets and falls in love with Hitihiti's granddaughter, Maimiti (Mamo Clark).